My art practice has grown out of my love of the ocean and my passion for building and making. I grew up on the coast of Central California surfing and shaping surfboards. This early experience with the creative process led me to start making sculptures in college, and my time spent in and around the sea prompted me to learn more about our oceans. 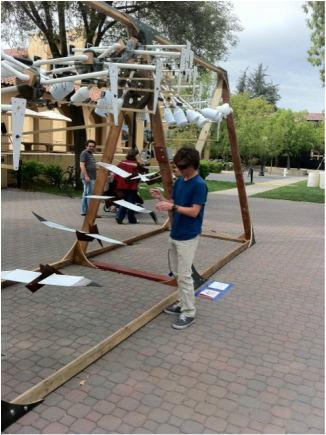 As a bachelor’s and master’s student in an interdisciplinary environmental science program at Stanford (2012), I studied marine science while learning to express myself through sculpture. I balanced my study of ecology and oceanography with coursework in mechanical engineering and studio art. If there is one thing that I have learned by studying the ocean, it is that it is greatly imperiled; it is treated both as humanity’s waste bin and its fast food joint. We simply dump too many pollutants into it while extracting too many organisms and resources out of it. My life’s intention is to help protect the marine environment, and I have found that for me, the best avenue through which to do this is sculpture. As a result, most of my works tell stories about environmental science topics, from marine plastic pollution to tuna conservation. My focus is on appealing to the basic emotions of the viewer such that they can understand the scientific concepts at play and internalize the gravity of humanity’s impact on the global ecosystem. I am inspired by the biodiversity of life on Earth, found objects, motion, and the interactions between the “human” and “natural” worlds.